Since his days as a graduate student at Yale in the late 1960s, Moore has maintained his method of composing paintings from multiple sources, attempting, he has written, “to collage those sources into a seamless whole.” Such faultless wholes can be found throughout the exhibition John Moore: Resonance, at the Center for Maine Contemporary Art, which features 22 oils on canvas and 5 charcoal studies. Take the stunning “Turnstile” (2012): a rusted gate from a mill in Coatesville, Pennsylvania has been moved north to the front of the Bangor Waterworks Building. The turnstile, which resembles a kind of torture apparatus, cuts across the view — it is both entrance and obstacle. Everything in this painting makes sense; unless you know the story of its component parts, there is no reason to doubt its veracity. Some of the Moore’s montage pieces can be disorienting. “Distant Voices,” from 2014-2015, utilizes multiple perspectives that can lead you to question what’s up and what’s down. Are we looking up through skylights at a cloud-inflected sky or is it a reflection? 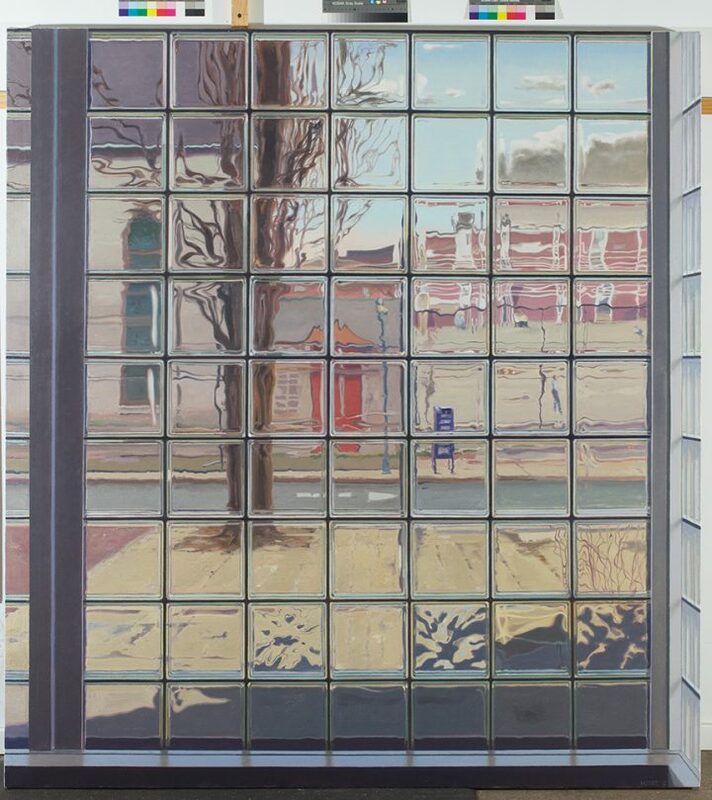 In a 2016 essay on Moore’s work, John Yau called the painting “vertigo-inducing,” an apt response to the work’s mix of Magritte and trompe-l’oeil. The same might be said for Moore. Immersed in a post-industrial world, haunted by the vestiges of America’s booming manufacturing days, he seeks to create a new reality. More than cutting and pasting, it’s a way to reinvent the world. His paintings are often set in factories showing their age and innards. In his catalogue essay, Christopher Crosman, founding curator of the Crystal Bridges Museum of Art, notes how Moore’s industrial images are not “the pristine, dynamic, mechanically charged images of Demuth, Sheeler and Crawford.” Paint peels from the walls, the windows are smudged, and the machinery has left the building. Indeed, pieces like “Sunday Morning Sunlight” and “Worth Street,” both 2017, might bring to mind Piranesi’s “Imaginary Prisons” series (1720-1778), except that the artist often renders a glimpse of light at the far end of his complex interiors. 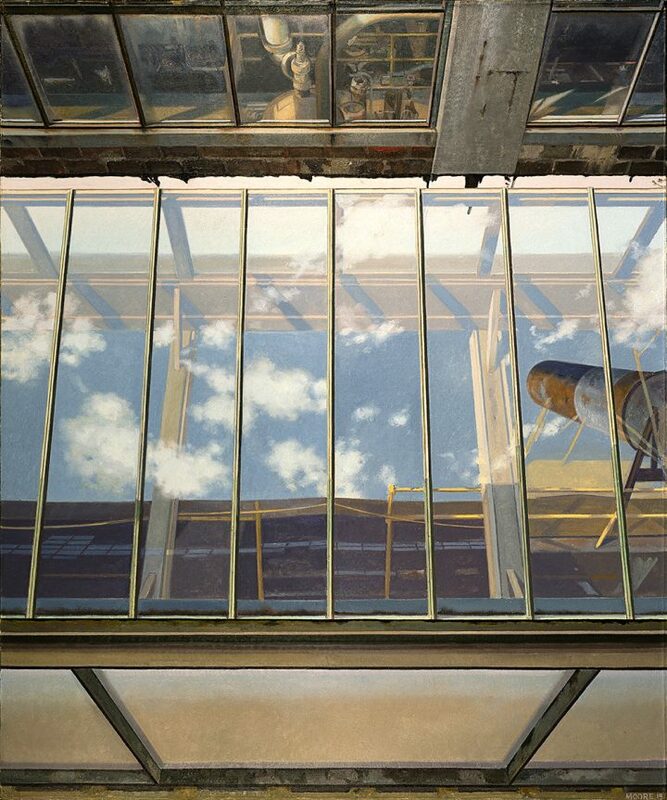 In the tradition of certain 17th-century painters, Moore might be called Master of the Glass Brick. Those vintage blocks found in factories of an earlier era appear in five paintings in Resonance. Depicting them makes for a bit of bravado on the artist’s part, as he brilliantly produces the blurring effect of the partially transparent walls on the world beyond. These glass blocks also allow Moore to explore abstraction. In “Frankford Station” (2012), the bottom rows of bricks that form a canvas-encompassing wall offer a wonderful assortment of miniature abstract paintings. Moreover, the glass bricks inspire metaphorical readings; as they distort and obscure the world, they make us question what we are seeing. Even when Moore portrays nature, the landscape is apt to be interrupted — and marred — by something man-made. In “Lake St. George Evening” (2017), a handsome sunset vista is nearly effaced by screened fencing that takes up more than three-quarters of the canvas, like a curtain moving upwards to obscure the glowing lake-scape. There may be something of a commentary here, about how we try to protect, yet in the process, visually pollute the sublime. However, paradoxically, the fence, and bits of foliage caught on it, are as beautifully rendered as the water, trees and sky beyond. For two recent paintings, Moore’s springboard is a statue — a timely subject considering the ongoing review and, in some cases, removal of Confederate monuments around the country. In “Harmony Place” (2016), we see the back of a caped and cane-bearing Hannibal Hamlin, Lincoln’s first vice-president and a Maine senator and governor. The statue, created by Charles Tefft (1874-1951), can be found in Norumbega Mall in downtown Bangor, but Moore transports it to a knoll overlooking a softball field in Coatesville, Pennsylvania, a mill town where, the painter notes, munitions were likely made during the Civil War. Another Bangor statue by Tefft appears in “River Drivers” (2017), inspired by the Peirce Memorial (ca. 1935), a larger-than-life tribute to the heroic Maine woodsmen who wielded ax and peavey in moving lumber to the sea. (The statue was donated by the descendants of Luther H. Peirce, a lumber baron.) While both statues speak to history and time past, “River Drivers” seems like an homage to one artist by another as Moore offers a dramatic silhouette of the figures set against the evening sky. The exhibition additionally includes five large-scale charcoal pieces, all 46 by 46 inches square, which underscore Moore’s brilliant draftsmanship. Like his paintings, several offer multifaceted views. “Picking Flowers” (2009) includes something rare in his oeuvre: a figure, in this case a woman crouched before a monolithic structure. A glass case in the middle of the large, light-filled gallery displays some of his sketchbooks and art supplies, including a watercolor kit. Studies of architecture, flora, fences and commercial signage bespeak his discipline. John Moore: Resonance continues at the Center for Maine Contemporary Art (21 Winter Street, Rockland, Maine) through June 17.